I recently decided to setup a small cluster of computers at home to be managed by Juju and MAAS. The computers are in the attic which meant that finger based power management was going to quickly lose its appeal. Many of my friends and colleagues have enviable home computer setups, with power control being done elegantly by iLO/LOM/Intel AMT or some such. None of my old tin boasted anything as grand as that. I could have used wake-on-lan as both MAAS and my old machines support it but it doesn't provide a reliable way to power machines off (they don't always have shell access) or to check their current power state (they may not be on the network). What I'd have loved to do was build a rebot but that would be costly and I'd have to design a bespoke rig for each piece of hardware since my old kit is not in neat NUC form. In the end I decided to get a Raspberry Pi Model B to do the job. Unfortunately, I know next to nothing about electronics and do not own a soldering iron so my solution had to be solder free. I found this blog (minus tampering with the power feed between power supply and mother board) and this blog (but extended to control multiple machines) both very helpful and they inspired the final design. ATX motherboards expose pins that a computer case uses to wire in the reset button, power button and power leds. I removed the connections to the case and instead wired the power and reset pins to relays controlled by the Pi and wired the pins controlling the power led into one of the PiFaces' Input ports. I used a Raspberry Pi Model B with a Piface hat. I had the Piface in a drawer so I used that for the prototype as it comes with two relays. The relays on the Piface worked but I needed two relays per PC. To get more relays I bought an Andoer 5V Active Low 8 Channel Road Relay Module Control Board. Oh, and by the way, one RJ45 jack cost twice as much as the 8 relay Arduino board. Connecting the relay board to the Pi was straight forward. I attached the ground pin to the Raspberry Pi ground and the 7 remaining pins to the 7 PiFace output pins. The relay also came with a jumper which I put across the VCC-JD and VCC pins for reasons. The PC part of the puzzle was simple. I used jumper cables with a female end and used them to connect the motherboard pins to a depressingly expensive RJ45 jack. The connections on the RJ45 jack are numbered, below is how I wired them to the motherboard. The breadboard in the picture was used for prototyping but was not used in the final design. The colours of the jumpers may not match those in the tables above because some got damaged and were replaced. I had problems with the second relay so it was not used. Once everything was connected, MAAS needs a way to remotely control the relays and to check the state of the input pins. I began by writing a Python Library and then adding a Rest Interface that MAAS could call. Finally I installed gunicorn to run the server. MAAS knows about a number of different power management interfaces and it was fairly straight forward to plug a new one in, although because it involves editing files managed by the MAAS package these changes will need reapplying after a package update. I believe that making power types more pluggable in MASS is in the pipeline. 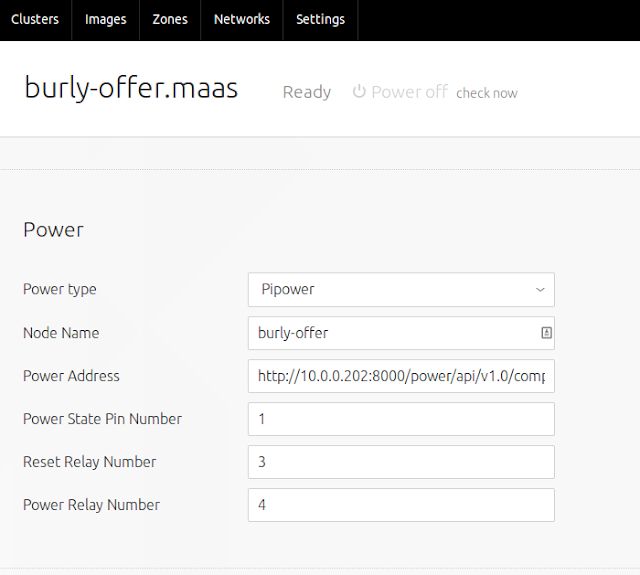 Firstly add a new template to /etc/maas/templates/power/pipower.template content here. Node name: Can be anything but it makes sense to use same node name that MAAS is using as it makes debugging easier. There are eight relays available and each computer to be managed uses two of them so the system will support four machines. However the reset relay is not strictly needed as MAAS never uses it which means you could support eight machines. I can now have MAAS provision the machines without me being physically present. So, for example, I can use Juju to fire up a fully functioning Openstack cloud with two commands. In the background Juju will request as many physical machines as it needs from MAAS. 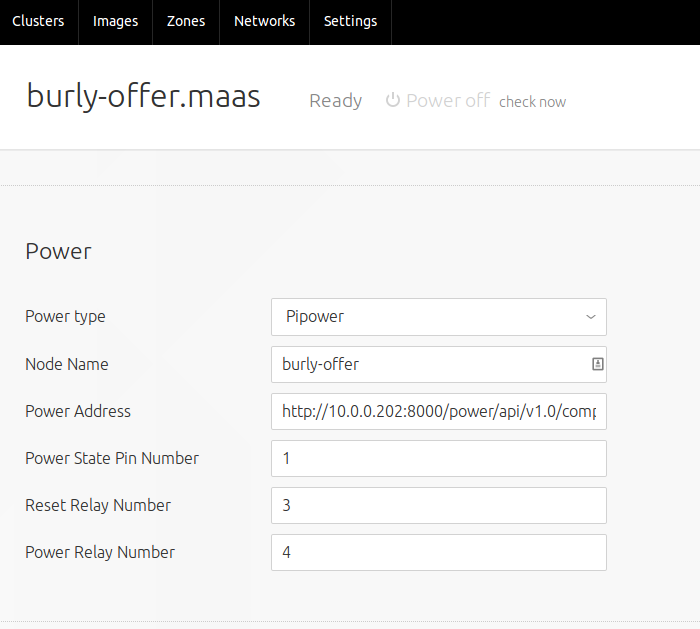 MAAS with bring those machines online, install Ubuntu and hand them back to Juju. Juju then uses the Openstack charms to install and configure the Openstack services, all while I'm downstairs deciding which biscuit to have with my cup of tea. Whenever I'm finished I can tear down the environment. MAAS will power the machines off and they'll be put back in the pool ready for the next deployment. Neutron Router High Availability? As easy as "juju set"
The Juju Charms for deploying Openstack have just had their three monthly update (15.04 release). The charms now allow the new Neutron Layer 3 High Availability using Virtual Router Redundancy Protocol (VRRP) feature to be used. When enabled, this feature will allow Neutron to quickly failover a router to another Neutron gateway in the event that the primary node hosting the router is lost. The feature was introduced in Juno and marked as experimental so I would recommend only using it with deployments >= Kilo. Creating a HA enabled router. The charms switch on router HA by default once enable-l3ha has been enabled. $ neutron agent-list | grep "L3 agent"
$ juju run --service neutron-gateway --format=yaml "ip netns list"
$  juju run --service neutron-gateway --format=yaml "ip netns list"
A keepalived process is spawned in each of the qrouter netns and these process communicate over a dedicated network which is created implicitly when the HA enabled router is added. Neutron creates a dedicated interface in the qrouter netns for this traffic. $  juju run --unit neutron-gateway/1,neutron-gateway/2 --format=yaml "ip netns exec qrouter-$ROUTER_ID ip addr list | grep  ha-"
$ juju run --unit  neutron-gateway/1,neutron-gateway/2 "cat /var/lib/neutron/ha_confs/$ROUTER_ID/state"
Added interface 4ffe673c-b528-4891-b9ec-3ebdcfc146e2 to router 192ba483-c060-4ee2-86ad-fe38ea280c93. $ juju run --unit neutron-gateway/1,neutron-gateway/2 --format=yaml "ip netns exec qrouter-192ba483-c060-4ee2-86ad-fe38ea280c93 ip addr list | grep  10.5.150"
PING 10.5.150.0 (10.5.150.0) 56(84) bytes of data. $ juju run --unit neutron-gateway/2 "shutdown -h now"
$ juju run --unit  neutron-gateway/1 "cat /var/lib/neutron/ha_confs/$ROUTER_ID/state"
$ juju run --unit neutron-gateway/1 --format=yaml "ip netns exec qrouter-192ba483-c060-4ee2-86ad-fe38ea280c93 ip addr list | grep  10.5.150"